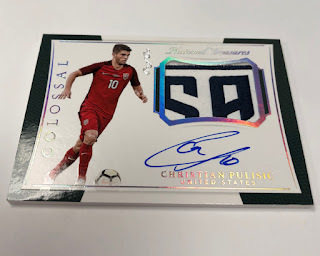 National Treasures, one of the benchmarks in the hobby when it comes to premium products, makes its soccer debut this Friday at Sports Cards Plus. And it’s bringing all the autographs and memorabilia cards for which the brand is famous. Every ten-card box has a minimum of eight hits, of which at least four are autographs. Boxes that don’t have a base set parallel have a ninth signed or memorabilia card. In a nutshell, the vast majority of what you pull is going to have some sort of premium piece involved. 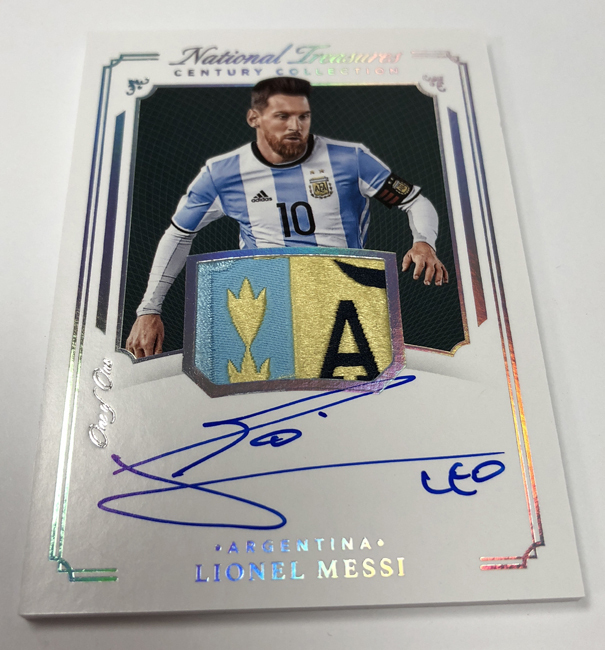 The 2018 Panini National Treasures checklist spans multiple generations with current and retired players. The focus is on players appearing in their national team uniforms. Signatures can be found in more than ten different insert sets plus additional parallels. Among them are International Treasures Material Autographs, which also come with a memorabilia piece. Every card in A Class of Their Own is one-of-a-kind. They have no parallels. 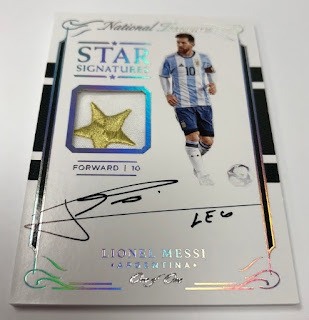 Debut Signatures (/99) highlights up-and-coming soccer stars with on-card signatures. Parallels come in Bronze (/25), Gold (/10) and Platinum (1/1). Variation versions are also available that have a different photo on the front and are noted on the back. These mark the first hard-signed cards from Philippe Coutinho and Michy Batshuayi, among others. 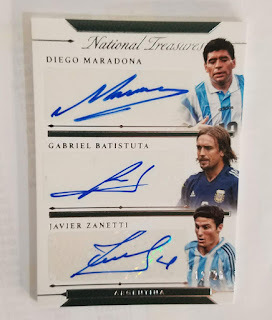 More than a dozen players are signing for Panini for the first time in 2018 National Treasures Soccer. These include Landon Donovan, Marc Wilmots, Jared Borgetti and Wesley Sonck. Adding to the super-premium nature of 2018 Panini National Treasures Soccer are cards that come with multiple signatures. 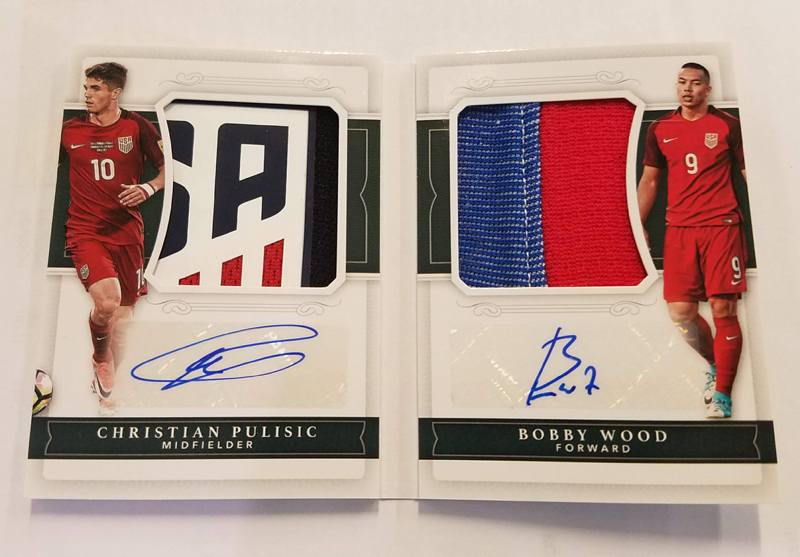 Dual Jersey Autograph Booklet cards combine to land approximately one per case, which only has four boxes. 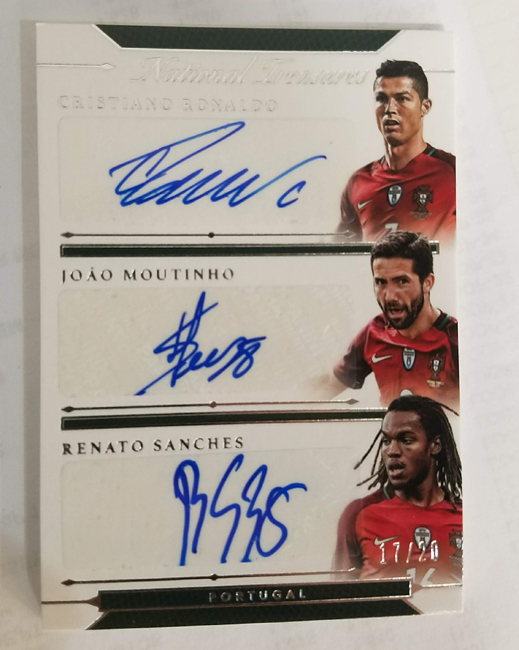 Triple Signatures cards are also randomly inserted. Memorabilia cards average out to three per box. These come in a variety of forms and swatch sizes. Among the big ones are Colossal Materials Gold and one-of-one Brand Logos, which come from one of the most recognizable parts of gear. 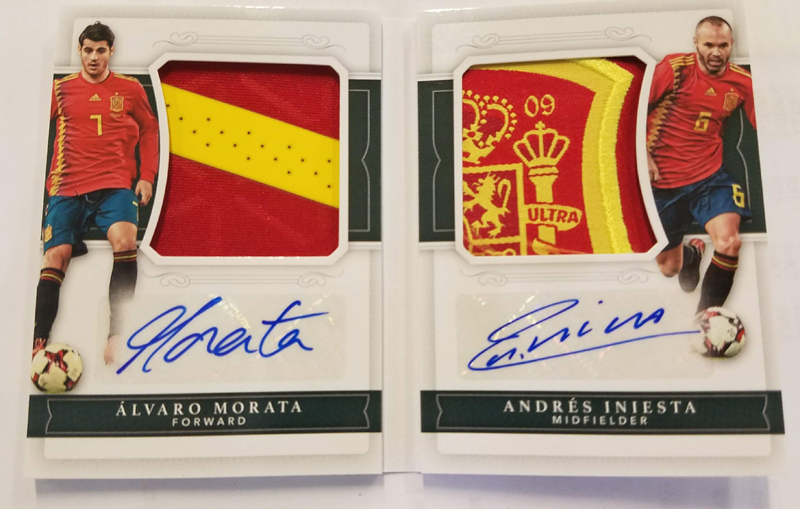 Base cards in 2018 Panini National Treasures Soccer may not have a signature or a swatch, but they uphold the product’s high-end nature. Besides an elegant design, all base cards come numbered to 50. Parallels are numbered 25 or less. 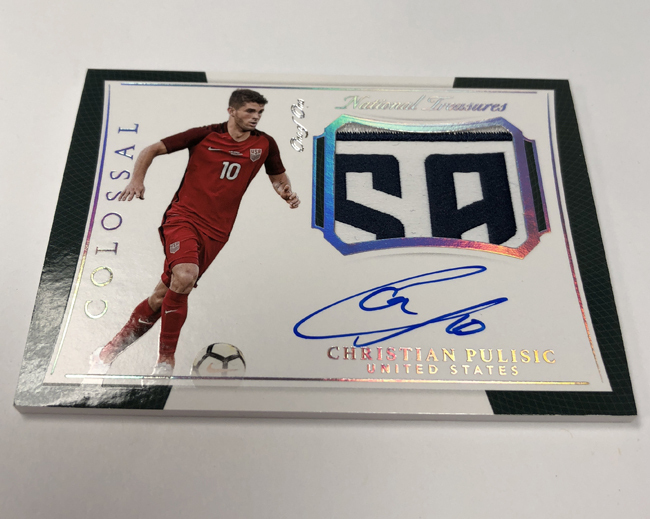 Given the international demand and the fact that only approximately 1250 cases exist, look for 2018 National Treasures Soccer to disappear in the coming months.